Suzanne Tait Design offers a full service interior design experience. Suzanne Tait studied interior design at Humber College of Applied Arts and Technology in Toronto. After graduating in 1995 she continued with her internship designing not only residences but also restaurants and nightclubs in the Toronto area. 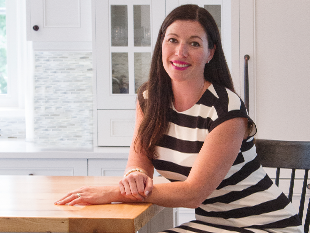 After moving back to the Kitchener-Waterloo area she decided to focus her skills and energy on residential design. Suzanne began working heavily in Kitchen and Bathroom design both for renovations as well as new home construction. In 2001 she met both Steven Sabados and Chris Hyndman of The Designer Guys and was able to work with them on 2 projects, one of them being their own loft in Toronto. Both of these projects have been well covered both on the Designers Guys television series and in The Designer Guys book. In 2002 Suzanne moved to Vancouver where she continued her work in the renovation sector. She then joined B.C.’s largest homebuilder as a Senior Interior Designer; liaising with architects from initial planning stages and selecting materials for new home finishes. Working on the company's show homes was a large part of the job; show homes that had a reputation for being the best in Vancouver. Suzanne has received much newspaper and magazine coverage. Wanting to set roots back in her hometown, Suzanne decided to leave Vancouver in 2004 to pursue her own design company back in Southwestern Ontario, servicing not only Kitchener–Waterloo but surrounding areas as well as the Greater Toronto area.